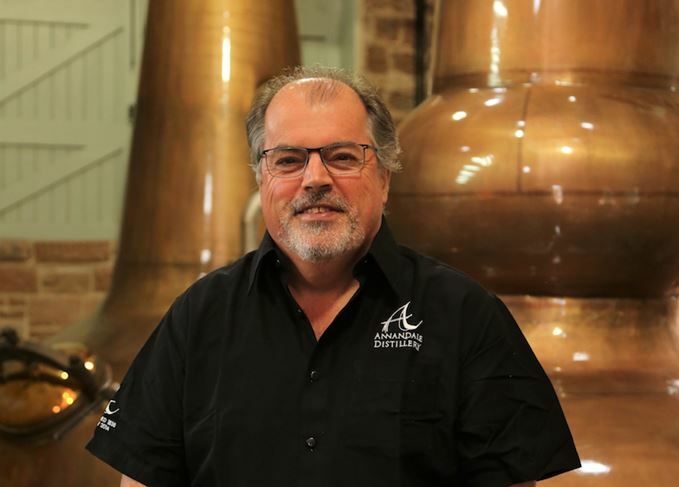 Professor David Thomson is co-founder of Annandale distillery in Dumfriesshire, and worked as a cereal chemist and university lecturer in sensory and consumer science before establishing Oxfordshire-based Mathematical Market Research (MMR) – claimed to be the largest privately-owned market/consumer research agency in the world. He spoke to Gavin D Smith. ‘I was born in Dumfries in 1954 into a family of shopkeepers (jewellers, pharmacists and stationers), and my first encounter with whisky was somewhat ignominious. ‘It took place in a caravan in Sandgreen (near Gatehouse of Fleet in Kirkcudbrightshire) where, aged 16 (I think), I was mistakenly given whisky instead of Sherry. I immediately retched until I nearly vomited. I’ve got no idea what whisky it was, but it probably wouldn’t have mattered, as I hated the stuff. ‘I didn’t touch whisky again until I was 21 and working in Cambridge, where a fellow Scot “taught” me to like whisky. It was an arduous evening course that lasted about four weeks. ‘He started me off on Canadian Club, made very long with American Dry. He then reduced the American Dry until it was about 50:50. After that he switched me to a cheap Scotch blend (I can’t remember which), again made very long with American Dry. ‘Over the next couple of weeks, he reduced the American Dry and finally removed it completely. Somewhere, amidst all of this “training”, I heard Stairway to Heaven for the very first time. The trick (apparently) is never to get even mildly intoxicated during one of the training sessions. It worked. I’ve loved Scotch whisky (and Stairway to Heaven) ever since. ‘I got involved with Annandale after my wife, Teresa, bought me a book entitled Scotch Missed, which catalogues all the single malt distilleries in Scotland that have closed. This mentioned Annandale. Until that time, I hadn’t been aware that there had ever been a distillery at Annandale, even though I was born 15 miles away. ‘For some reason, I misread the entry and thought it had been demolished. On reading the entry, my late uncle suggested to the contrary. He contacted his wife’s family (farmers in Annandale) and they confirmed that some of the buildings still existed. ‘We eventually tracked down the owner and convinced him to sell. He’d already applied for planning consent to convert the buildings into residences, and Historic Scotland had reluctantly agreed, because they saw it as the only hope for survival. ‘I doubt that I’d have taken the plunge if Teresa hadn’t pushed me. Working with Teresa throughout the Annandale project, and experiencing her enthusiasm, commitment and sacrifice has made me very proud of her (especially since she’s teetotal). Without her, there would have been no Annandale. ‘The biggest hurdle for me was finding enough time to devote to the project. It was (and still is) important that our other business interests should remain profitable, as these have been principal sources of finance (beyond our own private resources). ‘Rebuilding a dilapidated, historic distillery is very expensive. It also requires a huge investment in working capital before the distillery becomes cash-positive. We started spending money in 2007 and I doubt that we’ll break even until 2020/21. However, the worst is over (or so I hope), since we now have whisky to sell. ‘Seeing the final product in bottle and box was a very proud moment, and tasting the first spirit with the late Dr Jim Swan on Sunday, 9 November 2014 was huge. Filling the first cask a few days later was also very memorable. ‘On 1 December 2017, we had [Scottish rugby stars] Doddie Weir, Gary Armstrong and Finlay Calder hand-fill our first peated whisky into specially commissioned ‘Doddie Weir’5 a Man O’Sword’-branded bottles, to support Doddie’s Motor Neurone Disease (MND) charity. ‘I’m a huge Scotland rugby fan, so it was fantastic to stand shoulder-to-shoulder with these rugby greats on such a momentous day. The climax for me was singing Flower of Scotland in the kiln at Annandale with Doddie et al, my family and friends. The hairs on the back of my neck felt like red-hot needles. ‘Facing the world without Jim Swan was a huge emotional challenge for me. He was brilliant and one helluva character. Jim didn’t “consult” at Annandale, he “held court”! He made great whisky and he made us laugh. We loved Jim. I’d known him for 35 years, so I felt his death very keenly. ‘Luckily, the production team had really evolved under Jim’s tutelage so, by the time of his passing, they were ready to step up to the mark. They’re a great bunch of guys. Since then, we’ve been privileged to team up with Dr Gordon Steele. His knowledge is positively encyclopaedic, he’s incredibly helpful and he’s really good to work with. ‘When it comes to drinking whisky, I only ever drink Scotch. It’s not that the others aren’t any good, but Scotch has so much variety to offer. I’m definitely a “peaty” man. Caol Ila is amongst my favourites (although I was devastated to learn that it wasn’t matured on Islay). I firmly believe that single malt Scotch whisky should be matured in the microclimate of the distillery, as climate can have a big effect on maturation. ‘The climate in Annandale is never very hot or very cold, and usually very damp. Annandale distillery also sits in a hollow. Jim Swan always said that the environment at Annandale was close to perfect for maturing whisky. ‘This may be one of the reasons why Man O’Sword and Man O’Words, our peated and unpeated single malts respectively, are very drinkable at three-and-a-half years old. ‘I don’t enjoy heavily “Bourboned” or heavily Sherried single malts. Oban is an intriguing whisky. It has bags of flavour, but it’s actually quite hard to define it. ‘I’m not a “malt snob”. I enjoy decent blends, most especially Johnnie Walker Black Label or, if I’m feeling mellower, Chivas Regal (I think there’s a huge link between emotion and choice of whisky). I also enjoy Johnnie Walker Blue Label, but only if someone else is buying. Jim Swan designed Man O’Sword and Man O’Words with great care, and I really enjoy both (and I’m not just saying that). ‘So far, we only have our “early release of first production”: 10 casks each of Man O’Words and Man O’Sword, drawn from the 188 casks of 2014 production. These are expensive because they’re rare. I’d obviously wish people to sample them, but I’m fairly sure that some aficionados will keep them. ‘The next release will be 160 bottles drawn from our very first cask of peated spirit, filled by Doddie Weir on 1 December 2014. These will definitely be collectors’ items. ‘We may release some of our 2015 production towards the end of 2018. These will also be single cask single malts, presented in sequentially-numbered bottles, but at a lower price-point. I doubt that we’ll have enough mature stock to consider vatting for another three to four years at least. Swift whisky bar’s managing partner on making the ‘Scotch fairy tale’ accessible to all. Ncn’ean founder Annabel Thomas talks sustainability setbacks and why yeast is on the rise. VisitScotland’s regional director on Speyside’s growing appeal as a whisky tourism hotspot.